The Children’s Miracle Network Hospitals River of Hope Radiothon, which aired on WRVW-FM 107.5 The River on Dec. 8 and 9, 2016, raised $123,161 in pledges for Monroe Carell Jr. Children’s Hospital at Vanderbilt. For the first time, the annual event broadcast live from Seacrest Studios at Children’s Hospital. 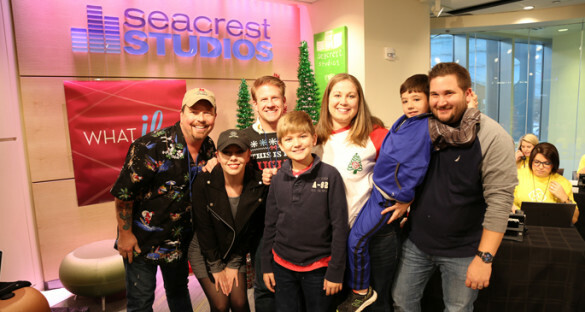 On-air personalities Woody Wood, Jim Chandler, Savannah Grimm, Jonathan Shuford and others interviewed patients, families and hospital staff about their experiences at Children’s Hospital, and listeners made pledges to benefit the hospital. Here, from left, 107.5’s Wood, Chandler and Grimm pose with the Graham family — Landon, left, Tonya, Chase and Josh — inside Seacrest Studios.